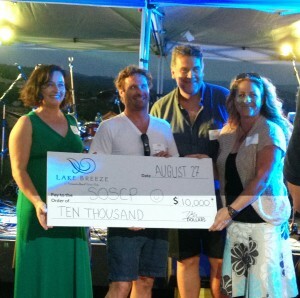 SOSCP was presented with a significant gift from Lake Breeze Wine Farm in Naramata. Lake Breeze has committed all of its patio sparkling water sales to the conservation partnership and presented Bryn White, SOSCP Program Manager with the donation at the annual Lake Breeze year-end staff party. “I was absolutely thrilled to accept this generous contribution on behalf of SOSCP,” said White. During the presentation, Lake Breeze owners Drew and Barb McIntyre thanked Bryn for the SOSCP’s conservation efforts and highlighted the important connections between what Lake Breeze does and the need for a healthy landscape in which to do it.